We are inviting you to join us to expand your understanding and use of colour in rug hooking. This class will use the book, The Color Lab as a textbook. 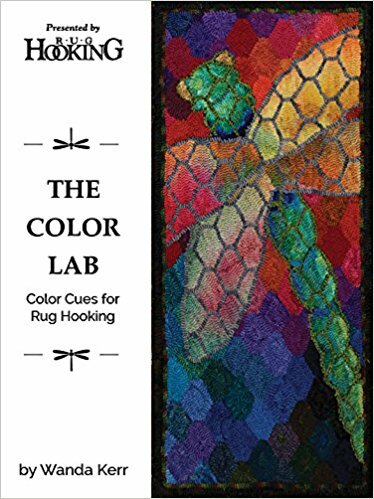 The author, Wanda Kerr, will offer support, answers and help to refine your colour work and some beautiful little gems we didn't have room for in the book. Starting April 1, 2019 this lifetime! class is structured to help you get the most from The Color Lab book. I'll post extra info, answer questions, critique your lab work and make sure you develop the skills with colour you need. The length of the class reflects the beautiful life long study colour is. We are starting with the basics and spinning them out into real skills you can count on! This is a wonderful price to pay for a life long lease on perfecting your colour use. You know, rug hooking is only about colour once you learn to pull a loop. Come on and get ahold of your most important creative tool! You want a colour crackerjack available to help you when you need it, don't you? Any questions? Use the form below to contact Wanda. Write us with your questions about this class!